Chris Nieves and Samy Jana. Samy Jana and Chris Nieves. They met on a cab ride to Fishtown, then sat next to each other at the cafe where mutual friends had organized brunch for July 4, 2016. Sam and Chris talked to each other almost the whole time. "He was hilarious," said Sam, who grew up in Chennai, India, and in Sharon, Mass. "I thought, 'Oh my God, who is this goofball?' "
By the end of the meal, they had exchanged phone numbers, and Chris, who grew up in West Nyack, N.Y., and moved to the Philadelphia area after graduate school, suggested several places they could go together. Within a week, they met for drinks and a discussion about the Barnes Foundation at SkyGarten, a rooftop beer garden. "And then we just kept seeing each other," Chris said. "She had a great sense of adventure. She knew what she wanted; she was assertive and not wishy-washy at all, and she could be so dynamic and lead a room." Sam took him on his first camping trip ever. They went biking, to many Philly festivals, and to play Pokemon Go with hundreds of others in Rittenhouse Square. Then, the approaching end of summer meant Sam would soon return to Cornell University in Ithaca, N.Y. They parted with no labels or promises, but one coincidence in their corner: Chris had gone to Cornell for undergraduate and grad school, was very involved with his fraternity, and made fairly frequent trips to Ithaca. One such trip came a month after Sam had returned to class. "He was hanging out with me more than with his fraternity brothers," she said with a smile in her voice. "That was my first sign." Sam visited Philly, too. Three months and four visits later, they were in Ithaca, having a serious discussion about where things were going. "Maybe going in we had the attitude that this was going to be a summer fling, but we both agreed it had become very serious," Chris said. The weekend before Thanksgiving, he met her parents, Bala and Rajini, and the weekend of Thanksgiving, she met his, David and Jeri. Chris, now 29, wanted someone with whom he could build a marriage and raise a family. Realizing that Sam was all that and more made him fall in love. Sam, now 34, sees the world in a way that's totally different from him, and because of that, she's taught him a lot, he said. "She's an amazing person who makes me better as a person," he said. "This isn't the type of relationship that feels like it takes energy from me. It builds me up and puts me in a better place, and I hope I do that for her, too." He does, Sam said. "He's so clearly caring and was just so open and honest about his feelings and the future that he sees for us," she said. "I was not a very open communicator before Chris. But he was able to pull that out of me – and it makes everything seem so much easier. It makes everything seem really possible, and exciting." As Sam's graduation approached, she and Chris both began job searching with the intent of living in the same city. She now works for a global technology consulting firm, and he's a risk analyst at an investment management firm. They live in Rittenhouse Square. The couples’ moms, Rajini and Jeri, light the candles that represent Sam and Chris. The couple used these candles to light the unity candle, a Christian wedding tradition, which then also served as the Sacred Fire from the Hindu tradition. In late August 2017, Chris planned a trip to Louisville, Ky., – perfect for two bourbon lovers. They left Philadelphia early one morning, and stopped for a halfway hike in Fayetteville, W.Va.
As Chris had planned, they reached a clearing with a spectacular view of the New River Gorge Bridge just as the sun was setting. "It was really beautiful," Sam said. "Then all of a sudden, he was on his knees. 'What are you doing?' I asked him. I was in shock." Chris was all nerves. "I just kind of mumbled, 'Will you marry me?' Or something inelegant like that," he said. "I was already crying," Sam said. "And of course I said yes, and we were kissing and hugging, and he was crying, too." On Friday night, the couple held a puja — a key part of the traditional Hindu wedding ceremony — in their home. 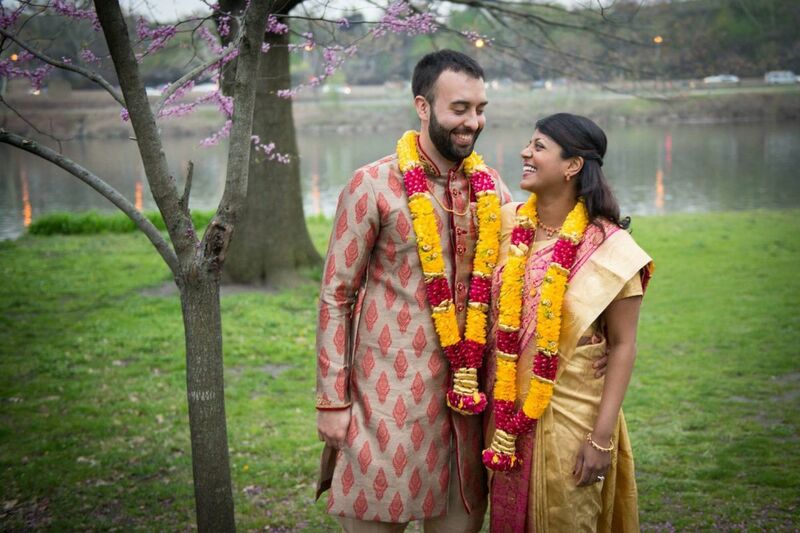 Sam and Chris wore traditional Indian wedding attire. Sam's mom and grandmother Subba led their immediate families in prayers asking that the couple be protected and nourished and find wisdom, energy, and strength. Sam and Chris exchanged yellow rose garlands and traditional gold marriage chains. The couple's parents and grandparents blessed them, and they were showered with rice and flowers. The following day, the hours leading up to their 6 p.m. ceremony at the College of Physicians of Philadelphia were jam-packed. "At 5:30, we both realized we were starving, and we had somebody run out and get us a turkey club at a nearby deli," Chris said. "Right before we went down the aisle, we shoved it in our faces." "We could have passed out during the ceremony otherwise!" Sam said. The celebration included elements from Hindu and Christian ceremonies, woven together by Susan Harte of Journeys of the Heart, a group of nondenominational officiants. "She took down our ideas and suggested some that were not on our radar — like having our moms light our two separate candles for the unity ceremony," Sam said. The unity candle also served as the Sacred Fire, and the couple took seven symbolic steps around it, each a blessing for things including an abundance of food, comfort and health, resiliency, strength, prosperity, and friendship. "Your two lives are now joined in one unbroken circle," Susan said after the seventh step. The cocktail hour and reception for 190, also held at the College of Physicians, featured a three-piece jazz band and a DJ, a meatball stand and mini-samosas, and a signature drink with notes of cardamom, lime, honey and mint dubbed the Philadelphia Mint. Chris' friend Jonathan gave a touching speech. The bride's friend Katherine led a hilarious reenactment of the text-message chain between Sam and her friends right after she met Chris. The couple had taken 10 dance lessons, but they chucked the choreography to sway back and forth to Ray Charles singing "Come Rain or Come Shine." The couple were having their pre-ceremony pictures taken when Chris' sister Ashley and his mom and dad walked in. His mom hugged him, hugged Sam, and the three of them cried. "That was when the gravity of the day, what everything meant, became clear," Chris said. Reciting her vows had that same impact on Sam, but one of her favorite memories came hours later, in the wee hours of Sunday. "We changed out of our wedding clothes and went biking on Schuylkill Banks," she said. "It was the first time we were alone again, together, after all of this tremendous activity, and we were married, and we could just sit and talk and enjoy that." A bargain: The couple didn't need many decorations, because the College of Physicians is "gorgeous all on its own," Sam said. The splurge: A great DJ and a great jazz band were very important to Chris. "That piece of the ambiance, if you get it wrong, it can throw things off drastically," he said. A week in New Orleans. Officiant: Susan Harte, Journeys of the Heart, Jenkintown. Venue: The College of Physicians of Philadelphia. Food: Elizabeth Savitz, Catering by Design, Philadelphia. Music: Jazz band, Louis Pettinelli Music, Philadelphia. DJ: Brian Latocha of Marc Fisher Entertainment, Philadelphia. Flowers: Simone Christian, Prestigious Petals, Conshohocken. Bride's dress: Custom Design by Irina Sigal Dressmaker, Philadelphia. Bride's sari: Fabric purchased by family in India, stitched by the bride's grandmother Subba. Hair/Makeup: The Rittenhouse Spa, Philadelphia. Groom's suit: My Suit, Philadelphia.